The Roberto Clemente Bridge was off-limits to drivers July 20-22, but road maintenance wasn’t the culprit this time. 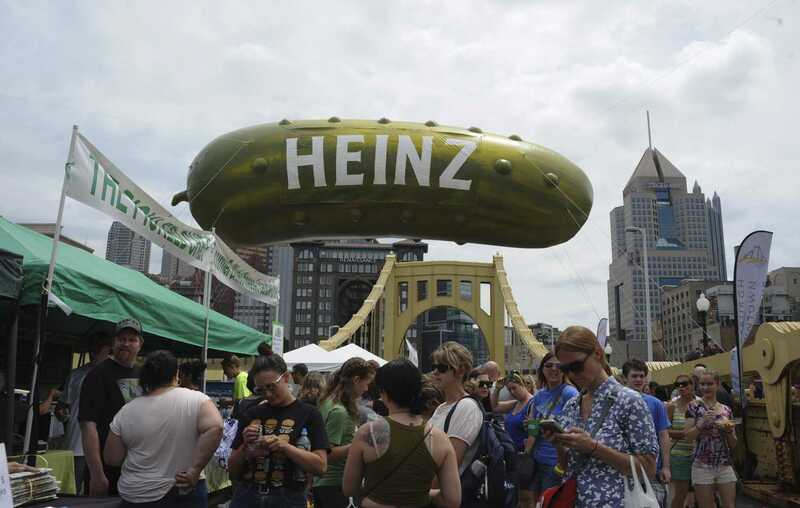 Instead, a massive, floating gherkin, vendors from all over the East Coast and thousands of Yinzers formed a celebratory logjam — all for the love of pickles. Marking Picklesburgh’s fourth annual celebration, this year’s gathering did not disappoint. With the Pittsburgh Downtown Partnership at the helm, the spectacle has steadily expanded since 2014. For the first time since Picklesburgh began, the festival occupied the Clemente bridge for three days instead of two — a decision made by the PDP in light of the event’s heightened popularity. But Picklesburgh wasn’t an instant draw. PDP President and CEO, Jeremy Waldrup, explained in an interview with CBS Pittsburgh that at the beginning, the PDP had to implore businesses to participate. However, as the event expanded, more vendors asked to participate and began experimenting with pickle products many months prior to the event. One such vendor, Grandpa Joe’s Candy Shop, celebrated its second year providing the Pittsburgh community with pickle-infused products. It debuted its pickle soda in 2017 and came back this year with pickle-flavored cotton candy, which sold out. The shop’s founder, Christopher J. Beers, spoke about his love for the pickle-themed event. “Picklesburgh is a great event because they have the right mix of vendors and the vendors they choose work really hard to craft products that make the event so unique,” he said. A variety of vendors, demonstration booths and kid-friendly craft stands — a part of the Lil Gherkins Activity Area — lined the entire bridge. Some folks learned how to make pickled turnips with Grow Pittsburgh while others tried unique food offerings such as Le Oriental’s pickle egg rolls. “Having the event on the bridge also adds a cool factor and this year they did a very good job of spreading out the booths and working with some vendors to better manage the waiting lines,” Beers said. Pittsburgh’s pickle party was accompanied by a wide array of live music. Positioned on the North Shore, The Giant Eagle Downtown Sound Stage provided a platform for local acts such as the twangy Buffalo Rose and rapper-singer Mars Jackson. Jackson, a graduate of Slippery Rock University, took a moment during his set to express his gratitude for Pittsburgh’s support. Not long ago, Jackson told the crowd, he was one of many festival-goers enjoying the event’s concerts. Adjacent to the North Shore’s musical attractions stood another stage contributing an entirely different form of entertainment — the 2018 Picklesburgh Pickle Juice Drinking Contest. Motivated by a grand prize of $500 and bragging rights, contestants raced to gulp down an entire quart of pickle juice before their competitors. Chugging champion Joe George from Mckeesport set a Picklesburgh record — 32 ounces of brine in 6.06 seconds. Waiting lines were common, especially for stands offering pickle-flavored alcohol. McLaughlin Distillery boasted three different varieties of pickle moonshine and Spirit presented the Moscow Moose — a cocktail accented with pickled rhubarb. Max Faucher, a resident of Oakland, was quite pleased with the fun alcoholic options as he checked out the vendors with a group of friends while holding a beer. “Some of it’s nasty, but it’s fun trying new stuff, especially when it’s free,” Faucher said. Bartenders offered free samples of pickle-flavored moonshine to guests over 21. Faucher and friends indulged before checking out other exciting parts of the festival — one of his friends was eager to try pickle dogs. Other guests bypassed the alcoholic options and went straight for the sweets. Jonah Girty of Bloomfield was unexpectedly impressed with the event and a sample he received. The popularity of the event does attract large masses of guests and new customers for local shops — an aspect of Picklesburgh that is very beneficial for vendors, including Grandpa Joe’s, according to Beers. The pickle-loving fans of Grandpa Joe’s will be excited to find out what special treats are set to come in the future, Beers said. However, that information is classified. “We already know what our 2019 new item will be, but that’s top secret until Picklesburgh 2019,” Beers said.